If you write a killer real estate blog post but neglect to spend a few extra minutes making sure it's fully optimized for better search engine ranking, you are missing a massive opportunity to build your organic traffic. Search Engine Optimization, commonly known as SEO, can play a critical role in helping you generate more traffic over time by opening up dozens or even hundreds of entry points on your website. If done properly, people will begin to discover your brand by visiting a blog post or web page. The big ROI payoff actually doesn't come from the increase in traffic alone. It comes from the fact that your lead's first impression of you is that you are providing helpful, relevant, well thought out content on real estate in your city - which establishes a level of trust that ultimately increases your conversion rate. So what considerations do you need to keep in mind in order to effectively keyword optimize your real estate blog posts and website content to generate more highly qualified leads? Follow these guidelines. A keyword is a term used to retrieve information in a search engine. For example: if you type the word 'real estate' into Google, the system will search for the most relevant content related to that keyword and will queue it up in the results list. 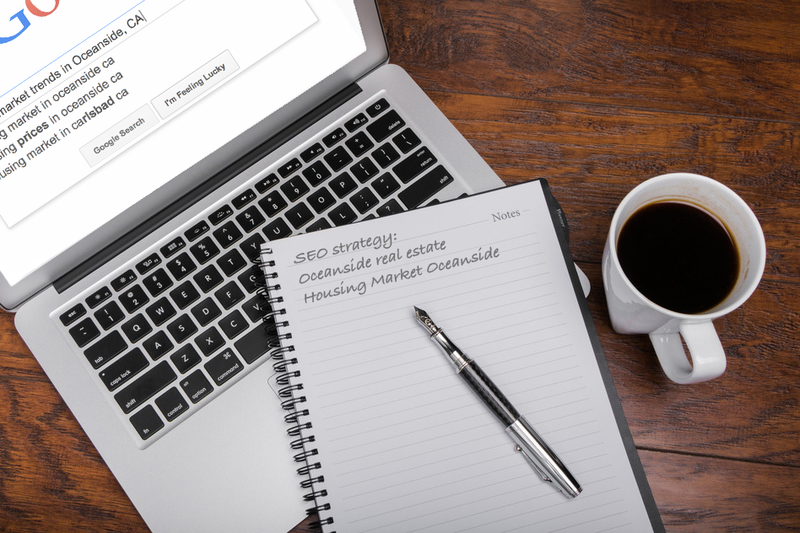 The first step to incorporating effective real estate search engine optimization into your marketing strategy is to identify what keywords you'd like to target. In real estate, it makes sense to go after long tail keywords that include the name of your city - for example, "housing market trends in Oceanside, CA" is a good option. For more advice on how to identify effective keywords, read this post. Make sure you include at least one of your keywords in your blog post or web page title. This is one of the biggest relevancy considerations for search engines like Google, so make it a priority. Try to stick with a title that is 70 characters or less so it doesn't get truncated in search results. This blog post is optimized around the long-tail keyword, "real estate search engine optimization", so I used it at the beginning of my blog post title to help get better search engine ranking. If we refer back to our real estate example, you could use something like, "Understanding Housing Market Trends in Oceanside, CA" or "How Housing Market Trends in Oceanside, CA Impact Buyers". If you fancy yourself a real estate blogger, write a post about local market trends and incorporate your long tail keyword into your content. Just be careful not to use it more than 5 times - as that could be considered "keyword stuffing". That essentially means search engines will think you're trying to game the system by using the same keyword over and over. If you're not blogging but have content on market trends on your site, be sure to incorporate the keywords you want to rank on into your copy. You can simply type the phrase in one of your paragraphs or could even use "Housing Market Trends in Oceanside, CA" as a header on one of your web pages. A meta description is an HTML attribute that provides a concise explanation of the contents of a web page and includes target keywords. This is the information you'll see in the page snippet on search engine results pages (SERPs). Optimizing your meta description is crucial because, along with the post or page title, it is a weighty consideration for search engines when determining content relevancy and where the content shows up in search results. For example, the meta description for this post is, "Learn how to incorporate effective real estate search engine optimization into your blog and website.". It includes my main keyword (real estate search engine optimization) and accurately describes what the content in my blog post is about. This one is slightly less important in that it won't affect your ranking as heavily, but it's an often overlooked strategy that can give you a little extra boost when executed properly. Choose a photo to include in your post, say a house for sale in a recognizable Oceanside neighborhood, and use your keyword as your photo's ALT text. The process for doing this will vary by site but in many cases, when you import a photo, the ALT text option will be listed in the photo options pop up. If you need help figuring it out, you can Google "How do I add ALT text to a photo in (the name of your site or blog platform)?" and the answer should come up pretty easily. Building out SEO optimized content specifically geared towards answering your leads most frequently asked questions can serve as a powerful tool to generate new, highly qualified website visitors, but the process of doing so is often either overlooked or done as an afterthought. The more optimized content you have out there, the more traffic you generate - and the sooner you start, the better your long-term growth will be.